Quantum Theatre parties with El Paso Blue. 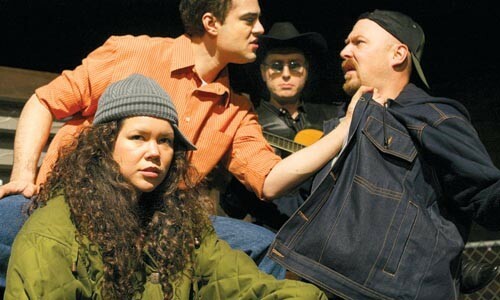 Ruth Gamble (left), Timothy Andres Pabon, John Marcinizyn (rear) and Jeffrey Carpenter often see red in Quantum Theatre's El Paso Blue. Photo by Mary Mervis. There's a theatrical party taking place right now at Quantum Theatre's Pittsburgh premiere of Octavio Solis' El Paso Blue. As with any Quantum production, you start with the evocative set, by Tony Ferrieri -- in this case the dusty, crusty fringes of El Paso, as represented by dirt roads, chain-link fence, the wooden skeleton of an old farm and a few other places I'd never normally visit. 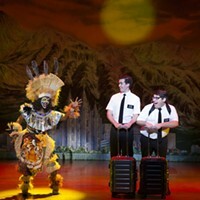 Additionally, El Paso is a musical of sorts, with guitarist John Marcinizyn onstage playing the songs as well as providing emotional underscoring. And then there's this hootenanny of a script. El Paso is an extravagantly written, emotionally overwrought potboiler that, even in its quiet moments, whoops with a full-bodied yell. Alejandro, the son of Mexican immigrants, has taken for his wife a Dallas beauty queen even wackier than he. She loves him, but when he takes the fall for his friend Duane and gets shipped off to prison, she's forced to move in with her father-in-law, the brooding, widowed Marcelo. Heterosexuals being what they are, Sylvia and Marcelo fall in love, and El Paso opens on the day a very vengeful Alejandro is released from prison. 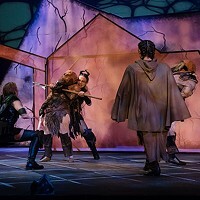 The play is told on two tracks. As Alejandro and Duane drive through the night to find Sylvie and Marcelo, we flash back to scenes explaining just how everybody got into this mess. Solis has a wonderful ability to write the oddest characters, plop them down in the middle of a world for which they lack the ability to cope ... and force them to find their way. He writes with a great deal of humor and an enormous humanity, and if El Paso is a sprawling, disjointed play, it's a highly entertaining one. Still, as with some parties, the guest list could use a bit of trimming. There's so much going on in the script that, eventually, it becomes too much. 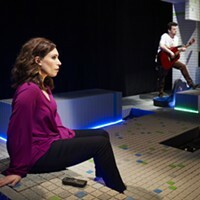 Solis' quirky, big-hearted characters wouldn't seem out of place in a Beth Henley play. The jazzed-up and spiky poetic dialogue has more than a bit of Sam Shepard in it, and there's a Christopher Durang feel to the violence underneath the yuks. And when Solis stops all the hijinks and zeros in on the drama, El Paso suddenly turns into an August Wilson "Daddy-why-don't-you-love-me?" melodrama. Five playwrights in a full-length one-act is, maybe, four too many. Director Shelia McKenna has worked overtime navigating this idiosyncratic script with her impressive cast: Jeffrey Carpenter, Tami Dixon, Ruth Gamble, Tim Andrés Pabon and Fermin Suarez. There's no faulting the work she and her actors do exploding Solis' humor and staying "true" inside so much theatrical conceit. That the sum of the production's parts seems greater than the whole reflects on the work itself ... since that would also be a perfect description of Solis' play. El Paso Blue continues through Dec. 17. 55th Street Warehouse (at the river), Lawrenceville. 412-394-3353.